Christopher's thoughts on the death penalty and life on death row. So with these facts stated, the only excuse one has for the death penalty now is strictly revenge. The only ones who are being affected by the death penalty are the poor and minorities. There are studies everywhere to back this up.Those who have money do not end up on death row. I have seen this personally because in Houston, TX, Harris County has lost only two capital murder cases in which they were seeking the death penalty and both cases involved white defendants who were millionaires! Prosecutors say they only seek the death penalty in cases where they feel they can secure a guilty verdict because it costs so much to prosecute these cases and involves a lot of time to prepare. Which means if one has MONEY to hire enough lawyers, they will not come to death row. 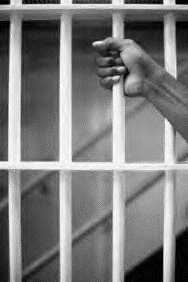 NO person should be on death row because of evidence consisting of hearsay and lies, and yet there are many here on death row because of such things. If they would have had money, they surely would not be here. The two cases in Houston that were aquitted I mentioned earlier had more physical evidence against them than many of those here who were convicted! Once again it shows that it is all about money! These are 14"x18" hard canvas pencil drawings made by Christopher while on death row. Click on photo for larger image. Click here if you would like to purchase one of these drawings or if you would like to display it in your gallery! 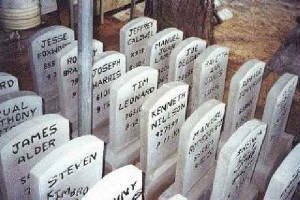 Gravestones of executed prisoners in Texas.